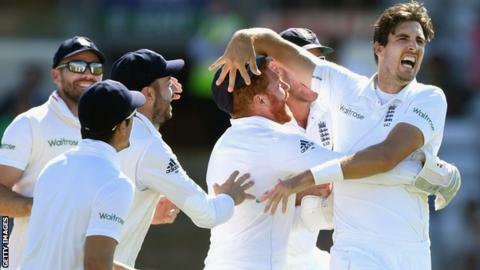 England's four-match Test series against Pakistan was gripping entertainment. It was the best series I have commentated on. I wish it could have continued. Officially, the series is not over. Under the new Super Series points system, there are still five one-day internationals and one Twenty20 contest to come. I want to focus, though, on what four terrific matches between the two countries have done for Test cricket. In that sense, the England-Pakistan Tests were perfectly timed. They proved that the Ashes brand does not own Test cricket, and that a bilateral rivalry need not be officially "iconic" to be utterly captivating. They proved too that cricket needs variety, and that Pakistan - so stable and resilient in this series - have much to give as a force in the world game. "What do you reckon? One more Test to decide it?" Yet there is a sense of regret as well as exhilaration. This Test series was over before it had taken shape. Imagine if the two captains, the stoic Misbah-ul-Haq and the imperturbable Alastair Cook, had got together after play had finished at The Oval and shaken hands on arranging a fifth Test. I know that there are existing schedules, flights booked, recommended rest patterns and the all the other obstacles imposed by busy professional systems. But who would have been brave enough to stop those two distinguished warriors if they had agreed a way to settle the matter decisively? Sometimes, paradoxically, I wish that cricket was less formally organised, and that decisions could be made by the protagonists alone. Phil Tufnell was right on the last day at The Oval; this series captured the imagination of the cricketing public. A fifth Test could have sold out. Every match brought new surprises. Few expected Pakistan to turn up at Lord's fit, drilled and totally ready. Even fewer expected Yasir Shah, match-winner in the first Test, to become peripheral in the next two. After the see-saw at Edgbaston, surely Pakistan were finished? Not so. This unpredictable series made me reconsider several of my opinions - as excellent sport often does. I have been an advocate of four-day Tests, with more overs to be bowled in each day. I'm not abandoning my position, but the superb Edgbaston Test certainly made me wobble. 'In extremis, the mask slipped from the face,' was the phrase used by Sir Tom Stoppard. It sums up well how the players reacted to pressure. In addition, I have championed the idea of a Test match championship. And I still do. But I am newly worried about the possibility that every "non-iconic" series - which, for England, would be everything apart from the Ashes - may be relegated to the status of a three-Test series. I remain committed to having a single Test champion. But the game needs to balance the elements that have always made Test cricket special with the innovations that keeps the sport relevant and give it energy. This summer, we have enjoyed gradually getting to know the Pakistan team. Were they ready for English conditions at Lord's? Would the thumping England victory at Old Trafford have a knockout effect? As one answer emerged, a new question was framed. That is the mark of proper Test cricket: the absorbing process of learning about teams and players, as their flaws and qualities are laid bare. Our affection and admiration for sportsmen is driven by coming to understand them through their play. "In extremis, the mask slipped from the face," was the phrase used by Sir Tom Stoppard in his 1982 play The Real Thing. It is a phrase that sums up well how the players showed their true qualities under pressure. Australia's visit to England for the 2015 Ashes brought the odd quirky photo opportunity - more tea, anyone? This series also provided a stark contrast with recent Ashes series, of which there were three squeezed in to little more than two years between July 2013 and August 2015. Each time, the Ashes rolled into town with full stately pomp. But the cricket? Well, there were some terrific one-off Tests - at Trent Bridge and Chester-le-Street in 2013, and in Cardiff in 2015. There were some unforgettable moments too, such as Stuart Broad's 8-15 spell at Trent Bridge in 2015. But as a sustained contest, all three series promised more than they delivered. That is no criticism of the players. Sport's magic cannot be organized in advance. Sometimes it clicks, sometimes it does not. In any contest, we wonder if the match-up of players will become more than the sum of its parts. After all, some teams, as if by magic, bring out the best in each other. It happened in the brief but sparkling England-New Zealand series last summer. No one knows until the bell rings. To maximize the chances of lucky pairings, the schedule relies on change and variety. No sport can afford to get stuck in the same groove. After a procession of heavily marketed Ashes series, and the damp squib against Sri Lanka in early season, this Pakistan series reminded us what Tests can do. For the first time in a good while, Test cricket created the forum for something that other sports cannot do. With its subtlety and depth, I found this series stayed in my mind even when the matches were over. The cricket created its own imaginative world, one full of surprise and possibility. So come back, Pakistan, neither too soon - nor too slowly.